Two Orlando favorites, Kaleigh Baker and The Groove Orient, recently announced over 10 tour dates in July with stops in South Carolina, North Carolina, Tennessee, and Georgia. Dates in Alabama and other states are still to be announced. Kaleigh received rave reviews for her performance in Andy Matchett's "Janis Joplin: Little Girl Blue" at the 2015 Orlando Fringe Festival. Her soulful voice and captivating stage presence has made her a staple at Orlando bars and venues, and her fans helped her raise over $20,000 for her upcoming album on Kickstarter. Released earlier this year, The Groove Orient's second EP, Generation Y, highlights the driven rock and roll vibe that earned it a spot on Relix Magazine's 40th Anniversary sampler. The band performs regularly around Orlando and at various Florida festivals. 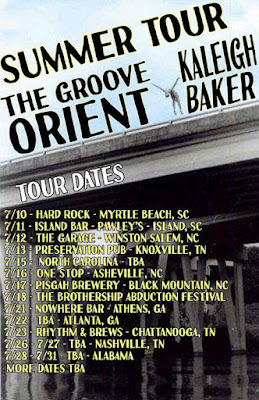 Catch The Groove Orient on June 27 at Roosevelt Collier's Suwannee Getdown at Spirit of the Suwannee Music Park. Both Kaleigh Baker and The Groove Orient have been nominated in several categories of this year's Best of Orlando poll. You can vote for them here (voting closes July 12).